Foreign Minister Mevlüt Çavuşoğlu discussed latest developments in Libya with his British counterpart Jeremy Hunt and EU foreign policy chief Federica Mogherini over the phone on Tuesday, according to diplomatic sources. The sources, who spoke on condition of anonymity, said Çavuşoğlu had a phone conversation with Hunt and Mogherini. On Monday, Çavuşoğlu discussed the latest situation in Libya with his Italian counterpart Enzo Moavero Milanesi over the phone. Health facilities near Tripoli have reported 47 people killed and 181 wounded in recent days as eastern forces seek to take Libya's capital from an internationally-recognized government, the United Nations' health body said Tuesday. The renewed conflict in a nation splintered since the 2011 toppling of Muammar Gaddafi also risks draining medical supplies, the World Health Organisation (WHO) warned. 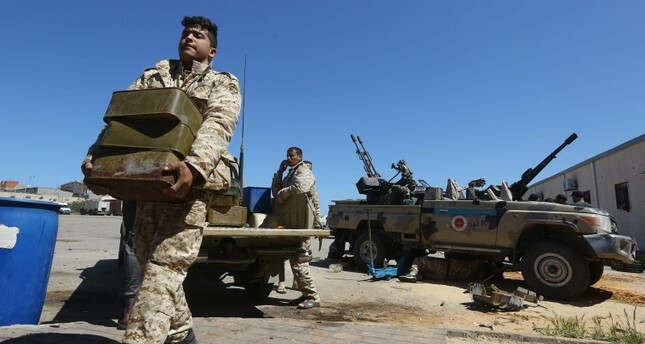 U.N. chief Antonio Guterres on Monday appealed for an immediate halt to fighting in Libya, after strongman Khalifa Haftar's forces claimed an airstrike on Tripoli's only functioning airport. Secretary-General Guterres "urges the immediate halt of all military operations in order to de-escalate the situation and prevent an all-out conflict," said a U.N. statement late Monday. A warplane belonging to East Libya-based forces struck the destroyed Tripoli International Airport on Tuesday, according to eyewitnesses. The oil-rich North African country has been rocked by violent power struggles between an array of armed groups since the NATO-backed overthrow of dictator Moamer Kadhafi in 2011. The U.N.-backed Government of National Accord (GNA) controls the capital, but its authority is not recognized by a parallel administration in the east of the country, backed by Haftar. The strongman has defied international calls to halt his advance on Tripoli, including from the U.N. Security Council and the United States. Haftar is a former Kadhafi military chief who has emerged as a major player in Libya's political struggle. Having seized control of much of eastern Libya -- and buoyed by a series of victories in the desert south -- he turned his sights on Tripoli, vowing to "cleanse" it of "terrorists and mercenaries." His offensive threatens to plunge the country into a full-blown civil war and once again thwart diplomatic efforts to find a solution to Libya's woes.